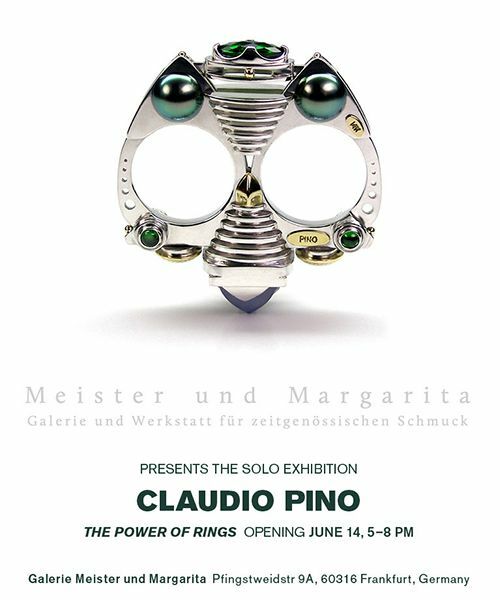 This solo show presents over 30 one-of-a-kind sculptural rings designed by Claudio Pino and also questions the unique Power of Rings. Whether worn daily or on special occasions, rings are the most common and evocative pieces of jewelry, wrote Rachel Church. Rings are very personal and embody symbolic meaning. They can be worn as protective talismans or simply as beautiful, precious accessories. What, then, makes a ring so powerful, even in contemporary times? Of course, we cannot disregard our past if we are to understand why rings remain so important in our culture. From ancient Egypt to the twenty-first century, their long, rich history is intricate and fascinating. Rings endure as objects that have direct connections to our body language and serve as a reflection of our appearance and style. They may also recall memories of our loved ones and represent victories, and their vintage surfaces project unmistakable power. Claudio Pino. Cristalline Collection. Elemente aus Gold 750`, Perlen, Rubine,Bergkristale, Kunzite und andere Edelsteine sind meisterhaft gefasst in transparentes Material. Claudio Pino « Infinity » – kinetic ring that explores the unique sensation of weightlessness. A moonstone attached to the center of a mechanism, portrays a drop of water floating freely in space. Even though the stone is fixed in the middle, it is able to pivot 360 degrees in all 6 possible directions, which is represented by each movable ring. Awarded with the Steele Trophy “Best in the Show” by Metal Arts Guild of Canada. 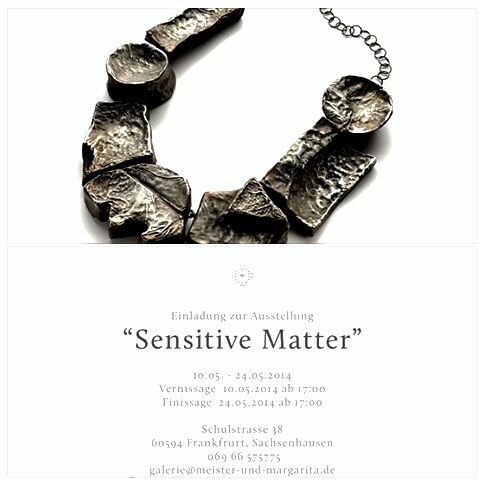 Vernissage 10.05 ab 17:00 bis open end!!! The first cognitive act that I accomplish at the beginning of a project is the definition of volumes, subsequently its design in space and finalize its forms exposed to Light. The desire to harmonize those forms, analyzed in their structure as complex as the human body. This study engages me to such a degree developing a fundamental sector of my research that gives lightness to those volumes, through use and experimenting of uncommon material. My work is based also on observation, even if the material has been attacked by age, is always subject to changing its shapes going through entropy, and according to the physical laws that regulate its structure, it maintains, at every following transformation, even in different shapes, a coherent harmony and aesthetical balance able to outweigh chaos. while I am producing my work, I reproduce this phenomena and intervene on it, crystallize a moment on its transformation and render it symbolic. Corrado de Meo – Anello Blush brush argento elettroformato, ossidi epennello da trucco.